Nestled in Berkshire County, a stone’s throw from the Thames River, Windsor Castle has been a royal residence for over 900 years. In fact, continue on the Thames towards London one will come upon Runnymede, the infamous spot on which King John was coerced to sign the Magna Carta. 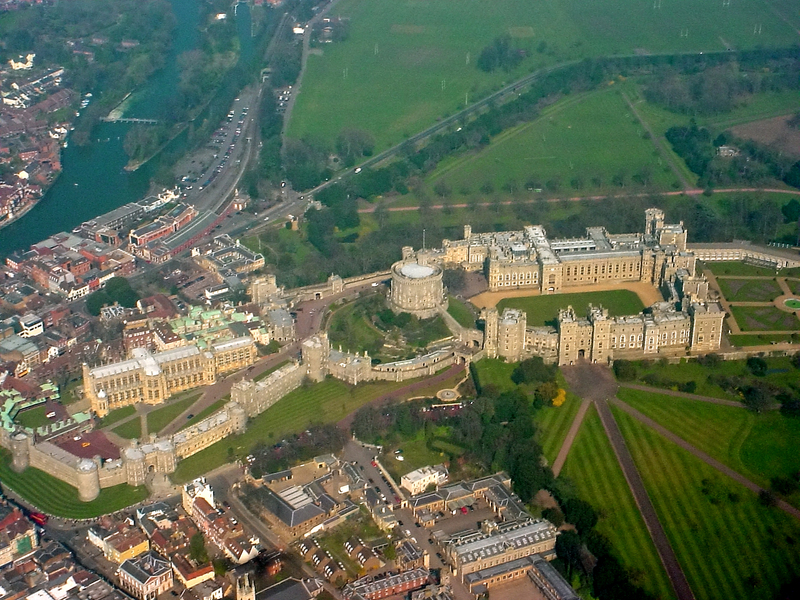 Windsor is a short carriage ride to Ascot, the Queen’s own race-track. Close proximity to the river was important for the southern residents of England. Traders living in Scotland and the northern part of the country could send down crops, wool, timber, and stone. Stone was especially coveted when it came to building castles, abbeys, and churches. Some of the best stone came from the Cotswolds, brought down river on barges. Windsor Castle was built in a ‘Shell-Keep’ style. A shell-keep refers to the oval or circular wall that surrounds the inner portion of the castle. There was one primary entrance, making it easy to control the access to the castle grounds. Successive monarchs added to the total complex, to make the Castle and the outbuildings what it is today: a royal residence of Queen Elizabeth II and home to the Knights of the Garter. Much of the original castle itself has been rebuilt, refaced, or hidden under the newer additions on 13 acres. 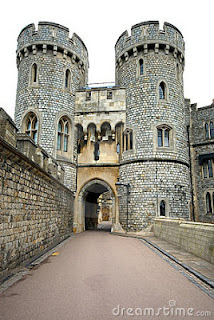 Windsor has long been considered one of the strongest fortresses in the British Kingdom, even used by Queen Elizabeth I at one point during the Spanish Armada. When Queen Elizabeth II is in residence, the Union Jack flies proudly from the round tower for all to see. This is a picture of the Albert Memorial Chapel. The original castle was fashioned from wood, readily available, after King William I (the Conqueror) defeated the Saxons in 1066. In the eleventh century, Windsor was remotely populated, but still a day away from the Tower of London, William’s royal residence in London. 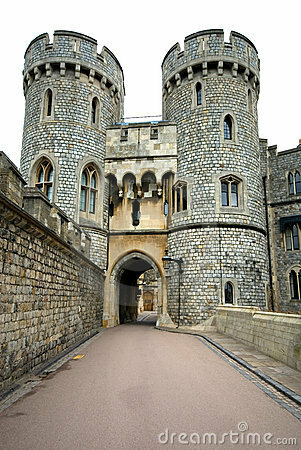 Windsor’s wooden structure was replaced with stone in 1165. It was built on a steep hill, giving the residents a view of anyone approaching from land or on water. The photot above is the Norman gate. Guards could easily see approaching persons from the tower. Windsor has a well, for potable water is important at all times, especially during a siege. The well at Windsor was dug 165 feet deep, 6 feet 4 inches wide and had stonework 60 feet down lining the well walls. 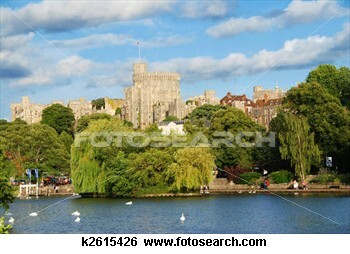 The many parts of Windsor have been added gradually over the centuries by many kings. 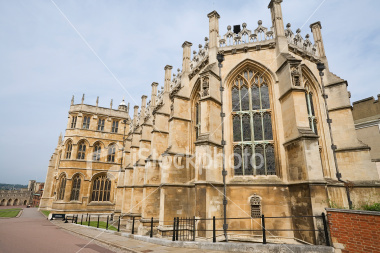 The Albert Memorial Chapel construction started in 1475 and was completed about 1528. The Round Tower was built in 1326 as part of modifications ordered by King Edward III. The State Apartments were partially destroyed in a fire in 1992. Tghe above photo is the main entrance, the Henry VII gate. You can still see the remnents of the portcullis between the towers. King Edward III founded the Order of the Garter, a chivalrous order consisting of 24 knights, the Black Prince, and himself. Edward felt the Order needed a place set aside for them, where their spiritual health would be cared for. 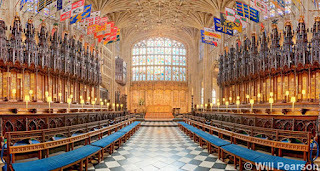 Being the generous soul he was, King Edward put down a letter patent on the 6th of August, 1348, for a college of 25 canons and one dean to guide them. Edward was also a smart man, and thought ahead. 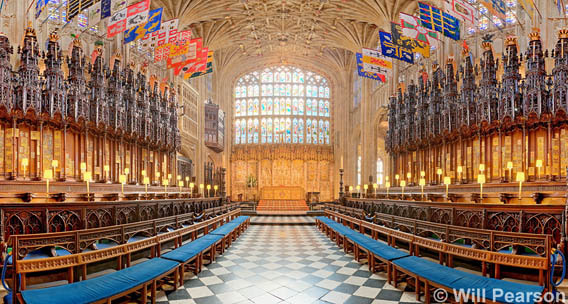 He knew his Knights of the Garter would most likely be out with him, handling the Crown’s affairs, so he made a provision for 26 Poor Knights to be included, who could ‘stand in’ during the church services to pray for the souls of the Garter Knights. The original St. George’s Chapel was serving its purpose, but it needed remodeling to accommodate the Order. In 1350, the additions were complete. After all, the Chapel had a relic: the heart of St. George, as given by Emperor Sigismund (brother-in-law to King Richard II) in 1417. It was tradition up until King Henry VIII, that the heart (in its reliquary) be presented to the Monarch, who would kiss it, and then in turn would pass it to each of the Knights of the Garter to do the same. 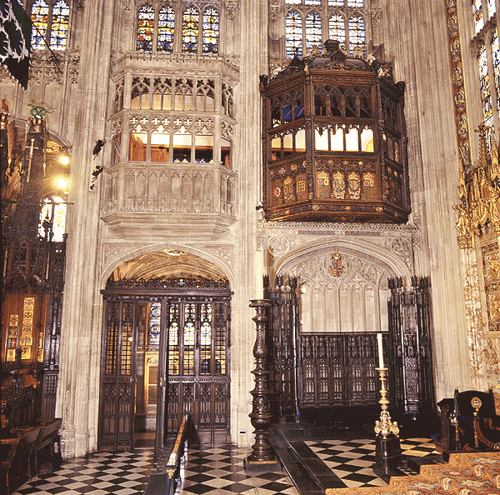 King Edward IV is buried under the iron screen to the botton right. Windsor Great Park, a 4,800 park surrounds the castle, across the river is the famous Eton College and a short distance from that is Royal Ascot race track. Savil Garden sits on 35 acres and has a beautiful rose garden among other delights. Boats still move along the Thames, sharing the water with the swans. The town outside of the castle has many old structures, including Guildhall which was built by Christopher Wren in 1832. 1999, National Geographic Society, Washington, D. C.